NSFA, Panacan, Davao City – A ranking NPA Terrorist leader who handles the group’s extortion money in Mindanao was arrested during a joint 4th Infantry Division, Philippine Army - PNP CARAGA Inter-agency Law Enforcement Operations in Brgy Bading, Butuan City on February 2, 2018 at about 3 o clock in the afternoon. 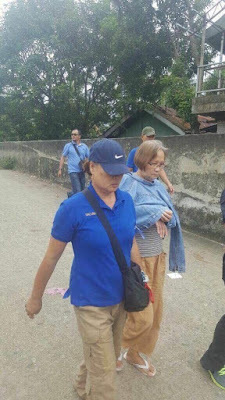 The arrested NPA Terrorist leader identified as Leonida Guao @Lea/Ligaya/Laya is the finance officer of the NPA Terrorists in the whole of Mindanao. With the help of the community, the arrest was made by virtue of warrant of arrest under Criminal Case number 5809 (murder) issued by Regional Trial Court Branch-7, Bayugan City, Agusan del Sur. The arrested terrorist is now under the custody of PNP CIDG CARAGA for further legal processing. Meanwhile, Lt General Benjamin R. Madrigal Jr. Commander of Eastern Mindanao Command expressed his appreciation for the cooperation of the different government agencies and the community that led to the arrest. "The arrest gave justice to the victims of their atrocities, particularly those Indigenous Peoples they brutally killed, the common people who have been victimized by their extortion and terroristic activities, and those who have lost their livelihood brought about by their arson and sabotage activities. This arrest is a result of the cooperation of the whole community and the different law enforcement agencies. It also proves that the terrorists cannot run away from the long arm of the law. " Lt Gen Madrigal Jr. said .